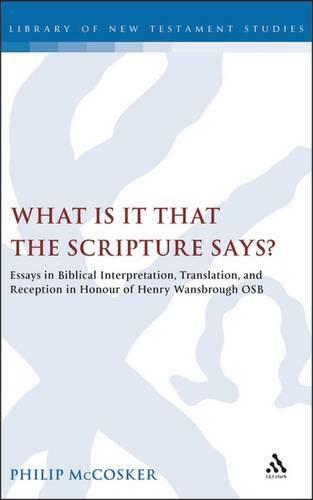 This volume of essays by distinguished international scholars celebrates and pays tribute to the multifarious contributions to the study of scripture that Henry Wansbrough OSB has made over the last 50 years, in a number of wide-ranging contexts, but most notably as General Editor of the New Jerusalem Bible. The essays answer the title's question in three inter-related areas: interpretation, translation and reception. Wansbrough's academic career has been focused in Oxford where he was Master of St Benet's Hall.Involved in many inter-religious and ecumenical dialogues, he is also a longstanding member of the Pontifical Biblical Commission, founded to foster and guide biblical studies. For much of his time on the commission he worked under Cardinal Joseph Ratzinger, now Pope Benedict XVI. Finally, as a monk of Ampleforth Abbey, Wansbrough has played a crucial role in scriptural studies for many generations of members of religious communities in the UK and abroad. Contributors include: John Barton; Willem Beuken SJ; Donald Bolen; Kevin Cathcart; James D. G. Dunn; Susan Gillingham; Mark Goodacre; Nicholas King SJ; Henry Mayr-Harting; John Muddiman; Wulstan Peterburs OSB; Adrian Schenker OP; Francesca Stavrakopoulou; Michael Tait; Albert Vanhoye SJ; Olivier-Thomas Venard OP; Benedicta Ward SLG; Bishop Kallistos Ware of Diokleia and John Webster. This is an important study of 'myth and ritual' relating to ancienct Judean kinship." Contributor Franceska Stavrakopoulou's essay reviewed in International Review of Biblical Studies, 2007.